Frederick Timpson I'Ons was born in 1802 in Islington, Middlesex, England and died in Grahamstown, South Africa in 1887. Before coming to South Africa in 1834 as a volunteer in the Sixth Frontier War, I'Ons owned an art school in Marylebone in London where he taught drawing, painting, handwriting and commercial subjects. Much of his original work dates in the first years of the 1830s and 1840s before he started painting souvenier portraits of Africans and local landscapes. He gave us a good insight into life in the Eastern Cape in the 19th Century. 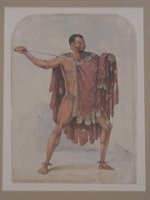 After 1850 he taught art privately in Grahamstown and travelled extensively in the Eastern Cape Province.